Yesterday was the girls Playcentre breakup with a shared morning tea. I pinched Beccaboo's Candy Cupcake idea and it went down a real treat! 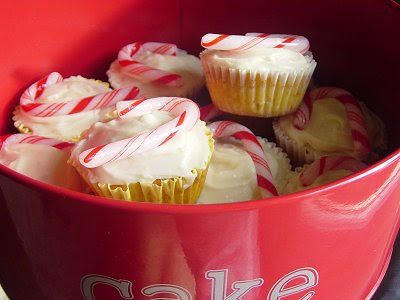 Simply make up plain cupcakes and ice with vanilla or peppermint icing. Top with a small candycane. Great gift idea too. I also have just received the "Christmas Spirit Award" from Christy at Sweet Tidings! Thanks so much Christy (doesn't she have a great name too)! You must be a true Christmas lover to receive this award. The person to whom you give the award must also be in love with Christmas. You must link back to the person who gave you the award. You must list 5 things that you love about Christmas. If you can't limit it to 5 things, then keep going till you run out of space! Pass the award along to as many people as you like.That can be 1 or 45; it's up to you. But, you must pass it on to at least one person in order to keep the Christmas cheer going! Let your recipients know that you have tagged them by leaving them a comment. 1. Remembering, pondering and celebrating the birth of Jesus Christ (especially with a "Happy Birthday Jesus" cake). 2. Spending time with friends and family on Christmas day, and the weeks that follow. 3. 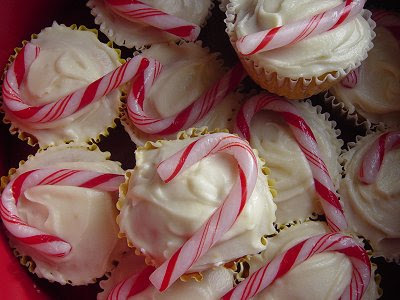 All the Christmas baking and crafting that comes with Christmas. 4. Seeing the kids excited at everything that Christmas entails. 5. Doing our annual "Christmas Lights" drive as a famly. 6. Giving to others (and the receiving part is fun too!). 7. Researching other traditions in other nations (like the fact that in Germany they celebrate Saint Nick on a seperate day in December by giving gifts to each other, and on Christmas day they celebrate the birth of Christ by a big family meal together). 8. Making up our own family traditions. 9. Seeing the NZ Christmas tree (Pohutukawa) flowering - a sure sign that summer is here! I would like to pass on this award to the following people, for sharing their great ideas, thoughts and passions regarding Christmas! The cupcakes are a great idea! I must remember them for next year! Thanks so much, it's great to have follow christmas lovers who don't hold back in the celebration. I will get cracking on my list!